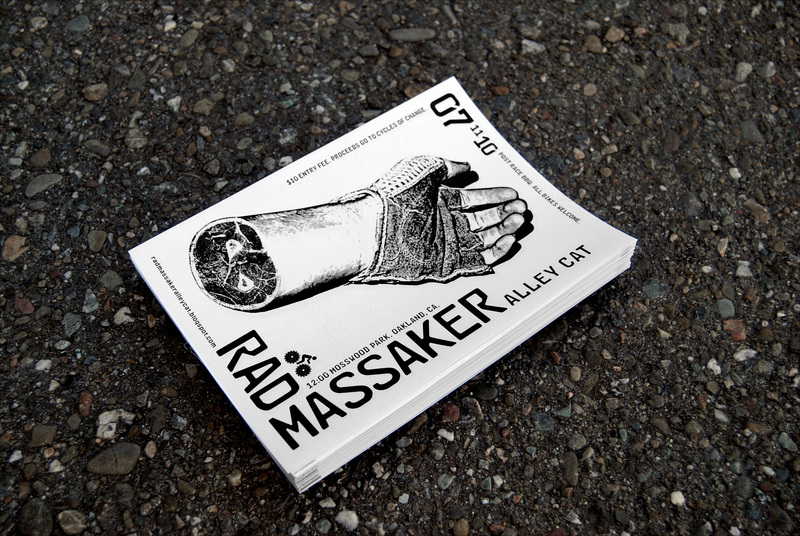 Rad Massaker Alley Cat. Collect The Body Parts! The illustration I did for last year’s race turned out so well, I figured I’d do it again this year, but instead of just creating a one-off piece, I wanted to create a “campaign” of sorts. 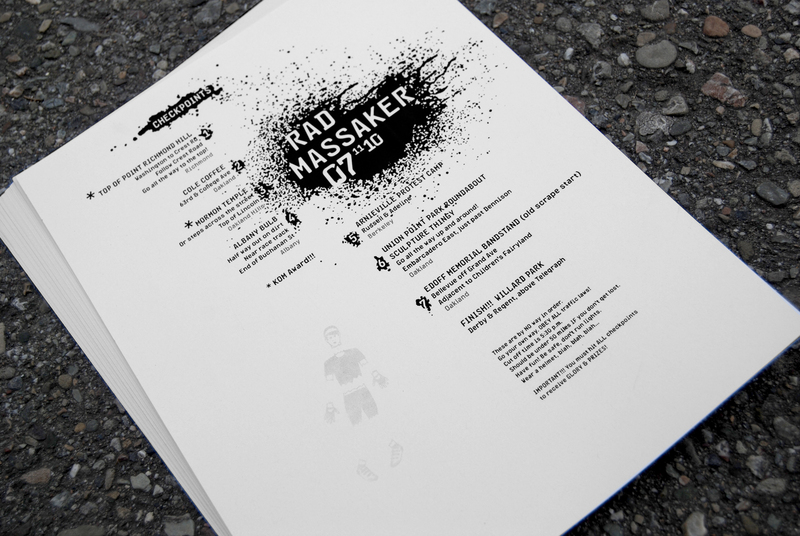 With the theme of RAD MASSAKER or “Bike Massacre”, I chose to build on last year’s concept: Bike as weapon and the severed body part motif. The first piece that had to be created was the handbill. Ideally, I wanted a different severed body part for each different piece of communication. And each body part would have a bike related element. I started searching online for a retro mesh no-fingered glove and found some that I liked, but didn’t really have time to order one. we needed to get the flyers out asap, and Blake was pestering me daily. I asked him if he had a glove and he did, but strangely enough, riding home from work that same evening I spotted a lost glove on Market Street, and surely enough… White mesh and old school without fingers. Perfect score. I coaxed my son, Khaner to model the glove and lay down in our street at night so I could get some shots. He reluctantly agreed, but jumped up every time he heard a car coming. Not because he was afraid of getting run over, but because of embarrassment. Ah, teenagers. I printed and trimmed a hundred flyers and handed them off to Blake the next day. T-shirts were the next hottest item. I went through a couple dozen t-shirt designs, but none seemed to do the trick. Blake wanted the illustration to be off-center to feel more “underground”. I just wanted it to look cool. The types of things I was working with looked best centered or in spots that would prove to be difficult to produce. 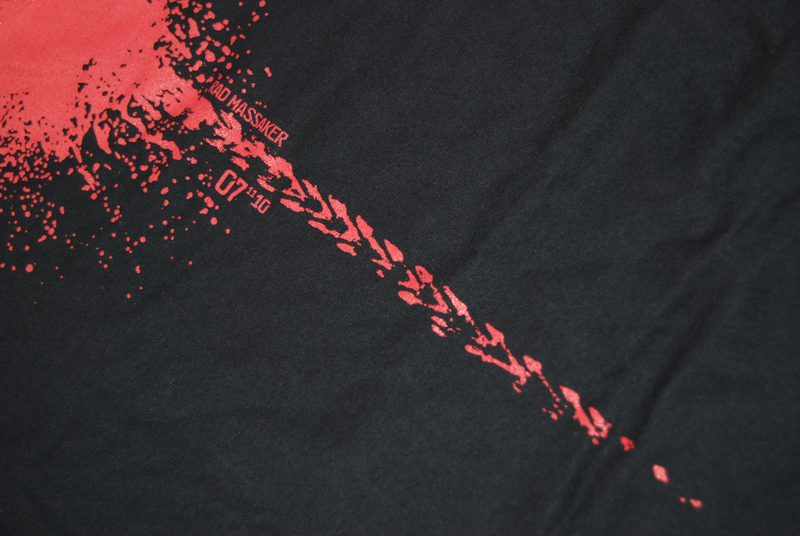 In the end, we compromised in terms of color, but we pushed the design off the top of the shirt and over the neckline to create the feel that the wearer of the shirt actually was the victim, and his throat had been slit. A bloody Randaneur treadmark was left as evidence of the assault. The spoke card was next. 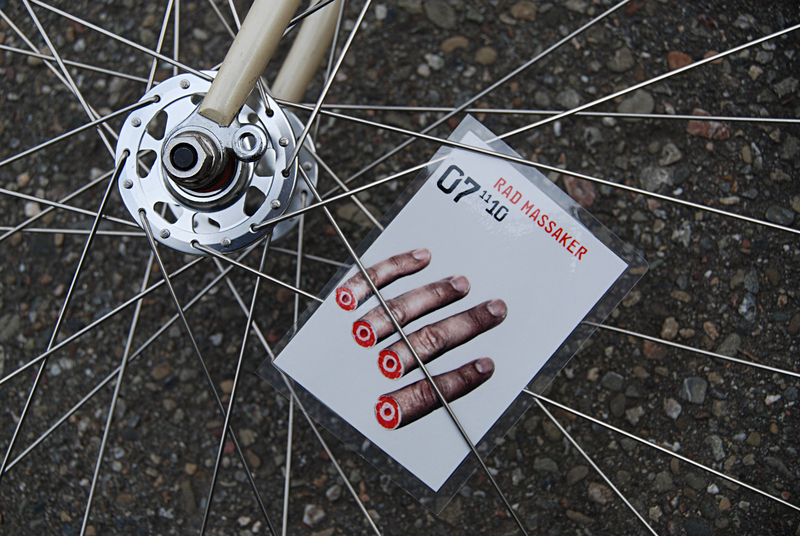 Sticking with the severed body parts theme, I lined up the fingers in such a way, that when the spoke card was placed correctly in the wheel, it would look as though someone’s hand had been caught in the spokes and the fingers had been torn off. A few riders actually got the idea. Most seemed oblivious. I took some of the “dead’ t-shirt illustrations and simplified them for buttons. In an Alley Cat race, riders are given a manifest, or printed list of locations. Riders must check in at each location, but not in chronological order… in the fastest order. 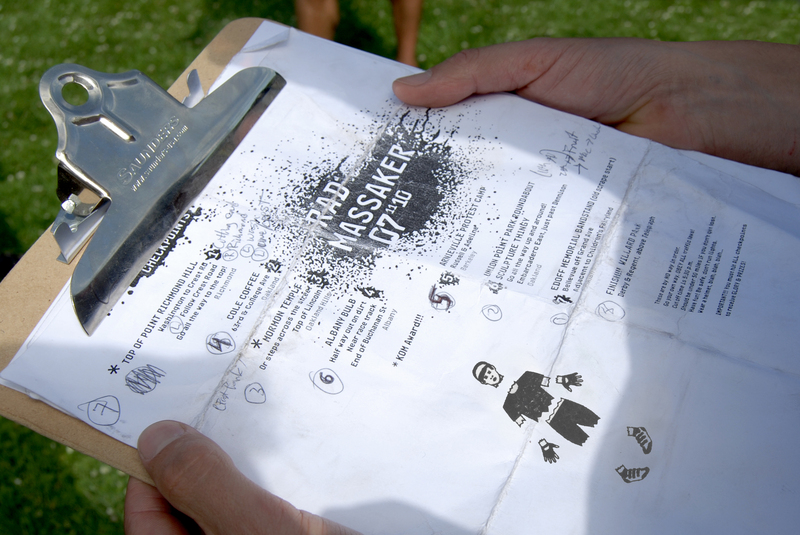 At each location a rider’s manifest is stamped. 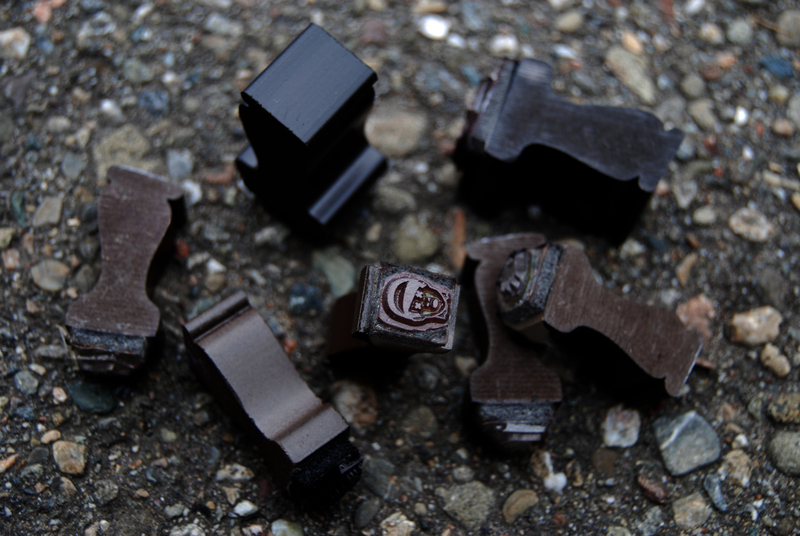 Once all stamps/locations are collected, he sprints to the finish for the final stamp. First one wins (obviously). To bring the theme to life, I created a body part icon for each checkpoint. 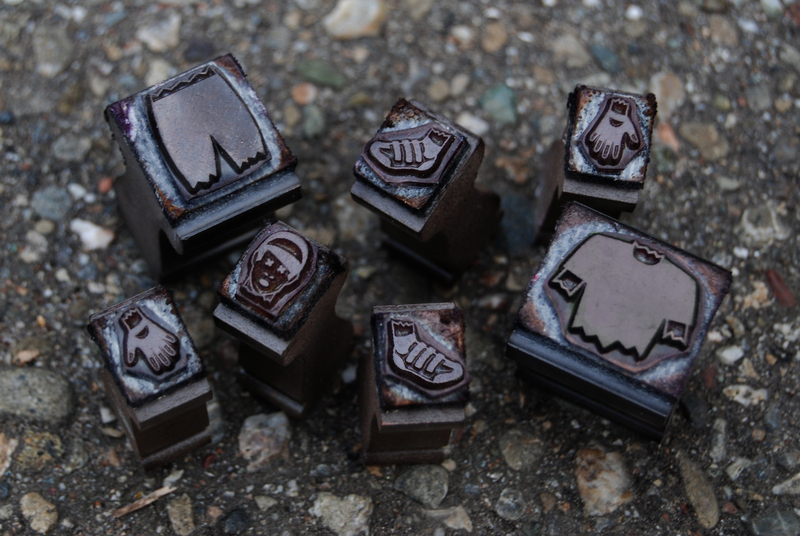 The icons were made into stamps. The goal: Collect all the body parts. Win cool swag, fame and glory.